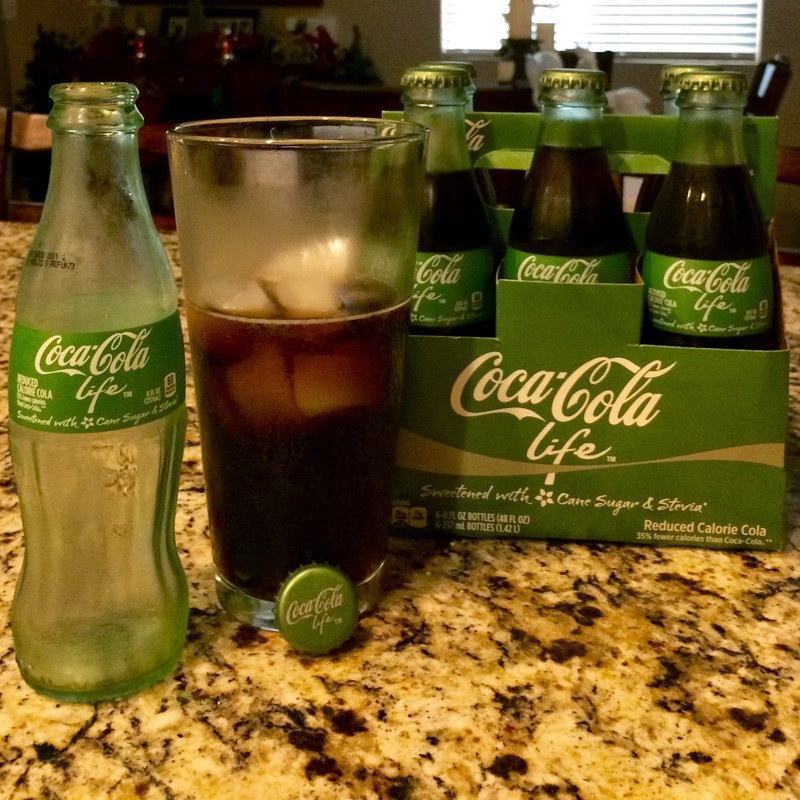 Coca-Cola Life is a new variant of Coca-Cola's classic soda, made with cane sugar and Stevia, to reduce calories while still being tasty. Beside its familiar logo and design, this beverage's taste is similar enough to the real thing, I'd say it works. First things first, I have always been a Pepsi fan over Coca-Cola, so this review may come with some Pepsi fanboy bias. I also must admit, for the past few years I haven't been drinking sodas like I was before, trying instead to live and eat more healthy by reducing my sugar intake and almost completely removing soda from my diet. But on to my review. The look. You'll notice the familiar logo and swooshing line on the packaging. Although the famous red is green for the Life variant, it's unmistakably a Coca-Cola beverage. The bottle too is the classic shape, but with a hint of green in the glass. The taste. My initial pour was odd. The carbonation filled the glass as though the beverage was still warm and being poured into a cold glass of ice. It was not however, having sat in the fridge overnight to chill. And, I'm not sure if this can be attributed to the first thing I noticed about the taste, but it seemed flat. There was not the extra bite and tickle of the carbonation I attribute more to Coca-Cola than Pepsi. I started over, drinking my next one straight from the bottle. It was good, really good actually. The flavor notes were typical to Coca-Cola Classic, with just a hint of the aftertaste that accompanies Stevia. And while I use Stevia in my morning coffee rather than sugar or artificial sweeteners, I think others will not mind the mild aftertaste. I think this is a really good alternate version of Coca-Cola. But for what reason was this made? The verdict. Coca-Cola mentions on their site that Coca-Cola Life has 35 percent less calories than other sodas. Although they also say they have a nutritional information section somewhere on the website, I couldn't find it to compare Life to the classic variant. The Internet seemed to have a lot of differing nutrition labels for Classic too. It's too much work for me, when I don't get paid to write this stuff. I'd say, Classic is probably really close to that 35% mark, having around 33 more calories per 8 oz container than Life. In my opinion, any reduction that doesn't sacrifice taste is a good thing. I think this soda is a step in the right direction for soda drinkers, as it still tastes really good and is close to the original, while shedding a third of its calories; however, I also think this will not go anywhere as a product, as the classic version's market share is way too strong for much money to be spent on marketing Life. Also, those that are looking to be more health conscious and who are willing to change from the classic version, are either going to be looking for a bigger reduction in calories and will be willing to sacrifice taste for the caloric reduction or will be looking for healthier options altogether by cutting out soda or find more natural options to fill their caffeine and soda taste buds. Final thoughts. I enjoyed Coca-Cola Life. It was really close to the original to me, with only a hint of Stevia aftertaste. While I don't see myself becoming a soda drinker again, this was a great soda, a nice change from the classic version, because there is a caloric reduction benefit. And while I don't see Life lasting, I don't see it getting the negative press of Coke II or other flops that try to pass themselves off as Coca-Cola.